2. Download and install Nanairo Theme GO Launcher EX. 3. Click Menu > Themes, choose and apply Nanairo Theme. 4. You main screen interface will look like the third preview screenshot with 5 icons on the dock bar. 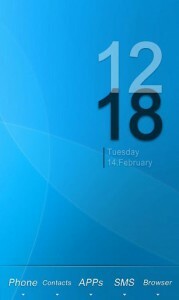 Drag and place your Phone and SMS icon into the middle. 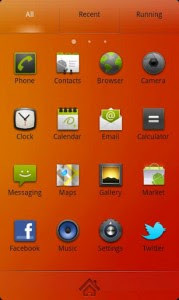 Then long press Phone icon > Replace > Theme Icon, and choose the corresponding icon as shown in the red box of the third preview screenshot. 5. Apply Transparent Icon into the apps at the both side of the dock bar. Long press the left app icon > Replace > Theme Icon, then choose the transparent icon as shown in the blue box of the third preview screenshot.